A special story submitted by a NHS member. Your involvement makes us who we are. I received this today in an email from my friend ANDRZEJ SZCZUDLO from Poland concerning his connection to the RYNKIEWICZ/RENKIEWICZ family from Krasnopol and also to the families who settled in Meriden, Conn. See attached file for a wonderful document translated by Andrzej's son Michal Szczudlo. Comments/Suggestions welcomed! I was jot able to load this document here on FB and so it will be placed on my Yahoo Home page for all to view. Here is the document and you must read all the way through! I come from Sejny, located on the Polish – Lithuanian borderland. There are my family roots, both the father’s and mother’s side. As a child I had a limited awareness of the subject. Those days my knowledge of a family circle was narrowed down to a few dozen people in the area. We've had maintained a close contact only with people from the neighborhood, due to the obvious lack of transport possibilities, as well as time for celebration meetings. In the stories repeated by my mother the most recent was a story about the nobility origin of her ancestors Buchowski. After some years I decided to check it, but also throw in something about my ancestral roots from the father’s side, the Szczudlo. That’s how I stepped deep into genealogy. I started digging information mainly about three names in the family: Buchowski - my mother's maiden name, Szczudlo and Rynkiewicz - paternal. From the Rynkiewicz came my grandmother Marianna, my father's mother. Grandfather left for eternity within a year after grandmother, in 1970. From my observation I gained an instructive memory: when she lived, he did argue with her to death, but when’s gone, he had the courage to say that he would rather have her sick, take care of her - if only she was. It reminds a well known phrase of Father Twardowski to haste in loving people because they leave so quickly. “I, Jan Renkiewicz, once using the surname of Rynkiewicz, born on May 13th, 1881, the son of Franciszek and Jozefa maiden name Andruszkiewicz, residing now at 5 Main Street, New Britain, Connecticut, USA, own the plot of land with an area of 8,40 acres bordering the north to the land of Jan Kowalewski, east of Boleslaw Nosekowski, south of Kazimierz Malinowski, and on the west by Stanislaw Karlowicz, located in Krasnopol, a former district Suwalki, Bialystok province now, Poland. Having had a lot of news about the “American Uncle” and powerful tool as the Internet is, at the beginning of the 21st century I made the effort to locate at least one person from the families of his twelve children. 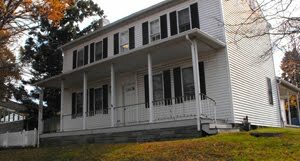 Information about the Renkiewicz of Meriden and the surrounding area are on the Internet, even with email addresses, but unfortunately no one responds the messages. Certain members of the family did accept my invitation on Facebook, but did not enter a discourse. In 1976, the American people were in need of something to celebrate. The turbulent “Sixties” were over but Vietnam and Watergate were still open wounds. The country’s bicentennial in 1976 was a good place to start the healing process. Throughout the year events were being held across the nation. Nanticoke City leaders were at the forefront of planning for a memorable celebration. On Memorial Day weekend a three-day event was planned for Central Park. There were shows, contests for children, dancers, musical acts and multitudes of people enjoying the festivities well into the night. 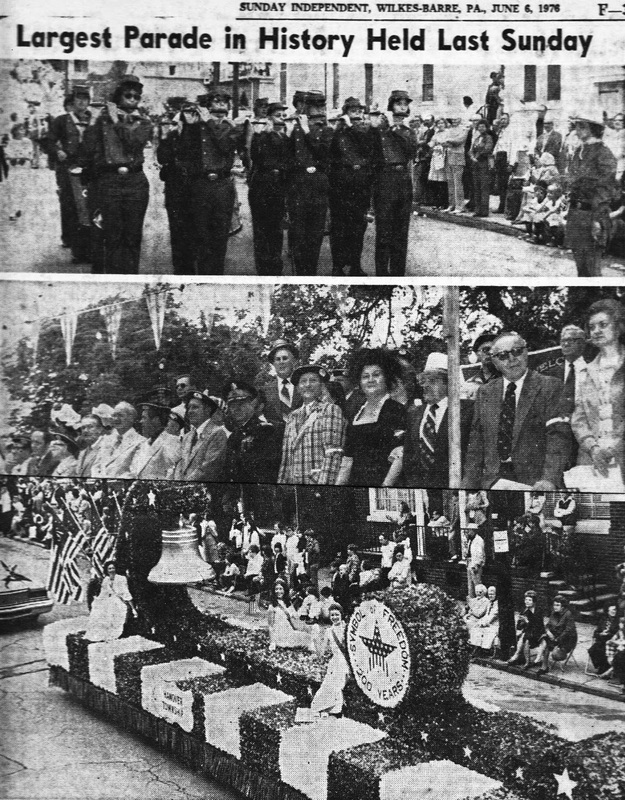 The Memorial Day Parade was expected to be one of the most impressive events to be held in the history of Nanticoke. It did not disappoint. Over 25,000 people watched as 95 churches, organization and schools, with over 175 units of floats, marching bands and decorated vehicles passed in review... An estimated 95% of the approximately 2000 participants were from the city. Lt. Col Andrew W. Winiarczyk, U.S. Army Ret., chaired the parade, assisted by Ronald Stashak, Al Ruck, James Goodwin, Millard Hafele, John Uren, Thomas Ellwood, Harold Welch, Melvin Swithers and Gary Bray. The color guard from the 109th Artillery led the parade. Committee chairman Frank Knorek, Millard Galat and Jule Zaniecki Co-chairmen and Winiarczyk rode in the official Bicentennial Car. Listed as “in the place of honor” in the parade, was Deborah Lupco of Nanticoke, who had been selected Miss Wyoming Valley that year. The Fishing Creek Confederates, a fife and drum corps from Bloomsburg, performed Civil War era music. The event was heralded as “unparalleled” in newspaper accounts. The city's “newly adopted Coat of Arms was introduced and displayed. Central Park was dedicated as “Patriot Square” in a program that included Paul E. Kanjorski, Joseph A. Grabowski, John Castagna, Judge Arthur Dalessandro, Stanley Glazenski, Congressman Daniel Flood, Leonard Omolecki, Fred Shupnik and Thomas Hill. Winiarczyk asked residents to wear attire and carry flags representative of their native land. Those participating were Rachael Welch and Kim Stankovic, as a colonial couple; Arthur Reese Trevethan and Beth Ann Trevethan, pioneer couple; Jeffrey Pollock, Native American; Lisa Marie Stashak, Czechoslovakia, Mitchel Braeta, England; George Dutton, Germany; Margaret Callahan, Ireland; Linda Williams, Israel; Donna Micocci, Italy, Soni Mailander, Korea; Theresa Webby, Lebanon; Ann Marie Glazenski, Lithuania; Tim Chong, Malalysia; Susan Michaels, Poland; Darcia Guravich, Russia; Bobby Allan Welch, Syria; Bohdan Krawczeniuk, Ukraine and Suzanne Edwards, Wales. George Pelas emigrated from Greece to the United Stated in 1914. He spoke on the subject, “ What America Means to Me.” Kiet Huynh, who came to the United States in 1975 from Saigon, South Vietnam, spoke as well. Also participating were descendants Revolutionary War heroes. Pictured left to right are Richard Buttrick, descendant of Major John Buttrick, who commanded the troops at North Bridge at Concord and on April 19, 1775, was the Minuteman who, “fired the shot heard 'round the world.” Carroll C. Moorhead, descendant of Charles Carroll one of the 58 signers of the Declaration of Independence, James J. Kelly Jr. and Ralph C. Gates, descendants of Major Gen. Horatio Gates, first Adjutant General of the Continental Army and victor over Gen. John Burgoyne in the Battle of Saratoga and Ruth Bloom Yeager and Robert Vincent Yeager, descendants of Daniel Boone, diplomat, pioneer and Revolutionary War officer. For posterity the names of those participating in the bicentennial celebration were recorded on an official document. Each received a copy. The original documents were placed in a Time Capsule and buried in Patriot Park.